These smart red golf umbrellas also make for great value printed promotional umbrellas when the colour has to be red. Read more below. Looking for a great value, low cost windproof, storm proof red golf umbrella? 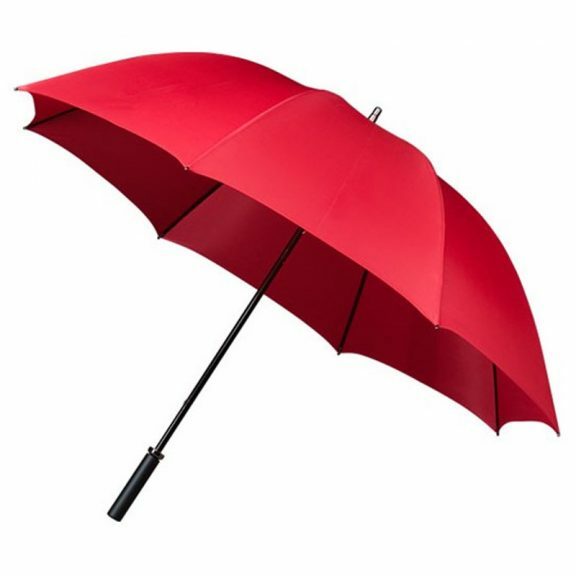 These stylish red Budget Storm Golf Umbrellas really do make for a great value golfing umbrella. Looking to buy in quantity? All the quality of a storm proof umbrella but available at a sensible, budget price – this Budget Storm red golf umbrella boasts strong storm proof fibreglass ribs to survive those damaging gusts. Also features a smart rounded black rubber handle. This helps adds that extra touch of style to this economy priced windproof red golfing umbrella. When your corporate golf umbrellas absolutely have to be windproof umbrellas or storm proof umbrellas but your marketing budget is squeezed, these red Budget Storm golf umbrellas really do make for a great value windproof advertising logo umbrella. If you need them screen printed with your company’s name or logo, please talk to us – we’ll be very happy to give you a quote. Canopy span: 125 cm / 49″, Length (closed): 94 cm / 37″. 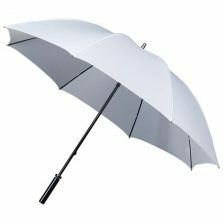 Whether you’re looking to buy just a single windproof red golf umbrella for yourself or a number of red windproof golf umbrellas for an event or as promotional printed umbrellas, the superb sensibly priced Budget Storm Golf umbrella is definitely worth a look. Does this red golf umbrella catch your interest? Check out the rest of our golf umbrellas range!